Drop the poatoes into enough boiling water to cover them completely and cook briskly for 10 minutes, or until the point of a knife can be inserted about 1 inch into a potato before meeting any resistance. Drain the potatoes. When cool enough to handle, peel them carefully with a small, sharp knife, cover with plastic wrap and refrigerate for at least an hour. Just before frying potatoes, grate them into long strips on the tear-shaped side of a four-sided stand-up grater. Toss lightly with the salt. In a heavy 10-inch slope-sided skillet (preferably one with a nonstick cooking surface), heat the oil and butter over moderate heat until a drop of water flicked over them splutters and evaporates instantly. Drop in the potatoes and, with a spatula, spread them evenly in the pan. Fry uncovered for 8 to 10 mintues, using a spatula to gently lift up a side of the potatoes to check their colour as they brown. When the underside of the potato cake is as brown as you can get it, without letting it burn, place a plate upside down over the skillet. Grasping the skillet and plate firmly together, invert them quickly. Then, carefully slide the potato cake, browned side up, back into the skillet. 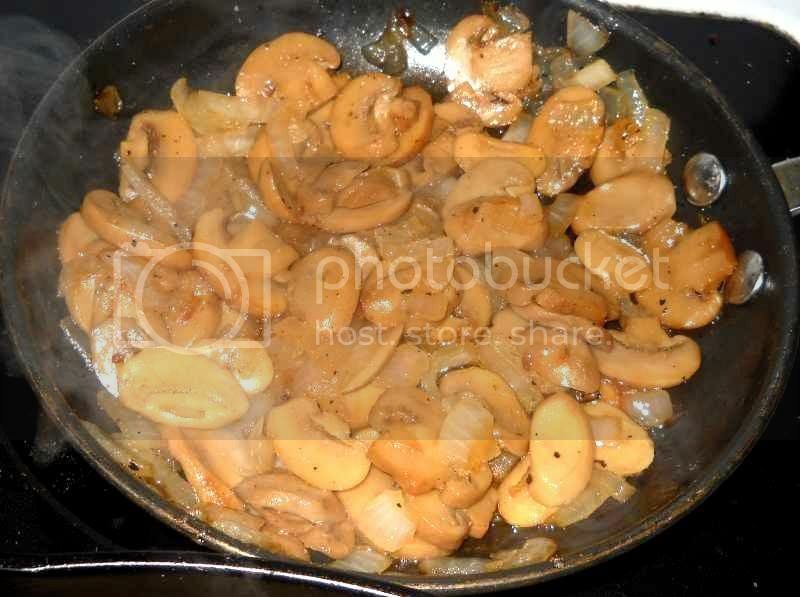 (If you are not using a pan with a nonstick surface, add more butter and oil before returning the potatoes to the pan.) Fry for 6-8 minutes, or until the bottom side of the potatoes is as evenly-browned as the top and the edges are crisp. Slide the potato cake evenly onto a heated platter and serve at once. 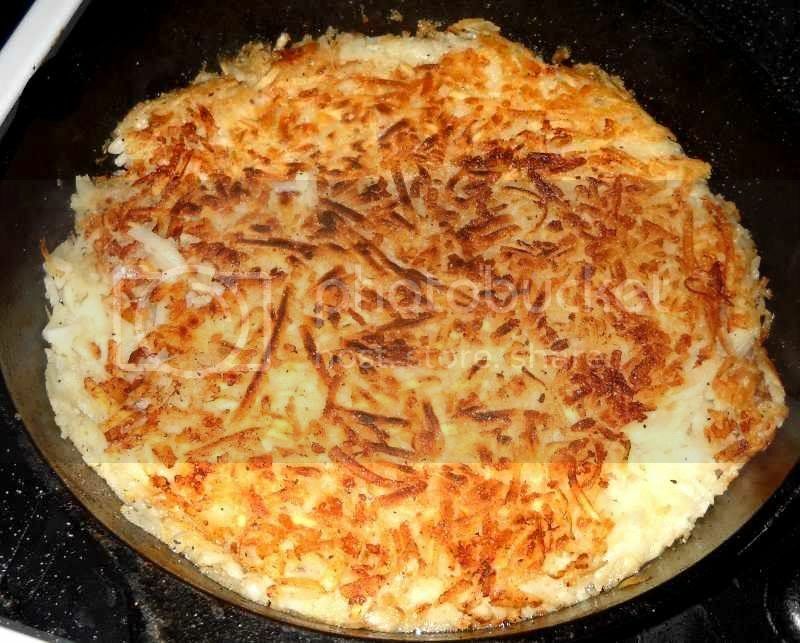 NOTE: Rösti potatoes are often made with onions or bacon. Sauté 1/2 cup of finely chopped onions in 3 tablespoons of butter until they are soft and transparent. 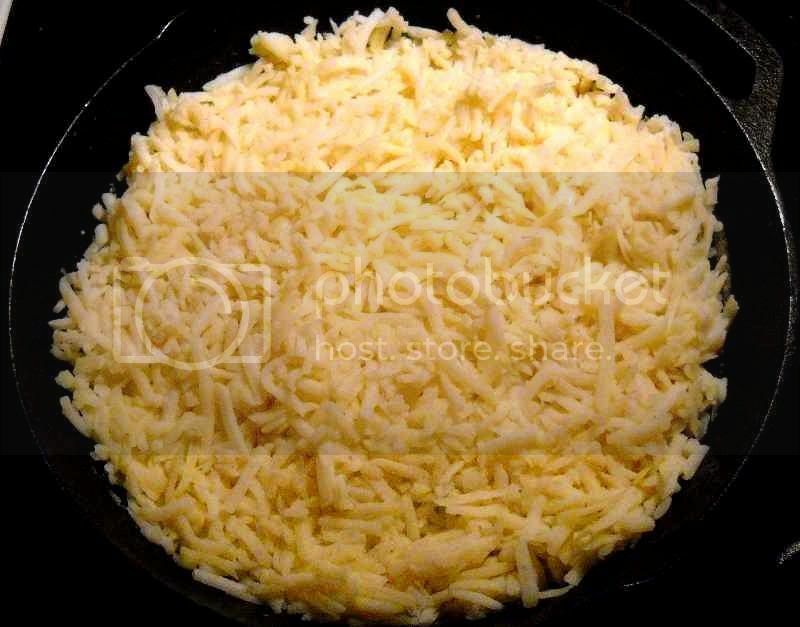 Drop half the shredded potatoes into the skillet, pat them flat and smooth and spread the onions evenly over them before adding the remaining potatoes, patting them down as before. Or fry 1/2 cup of finely diced bacon until the bits are crisp, drain on paper towels and spread the bacon over half the potatoes as described for the onions. 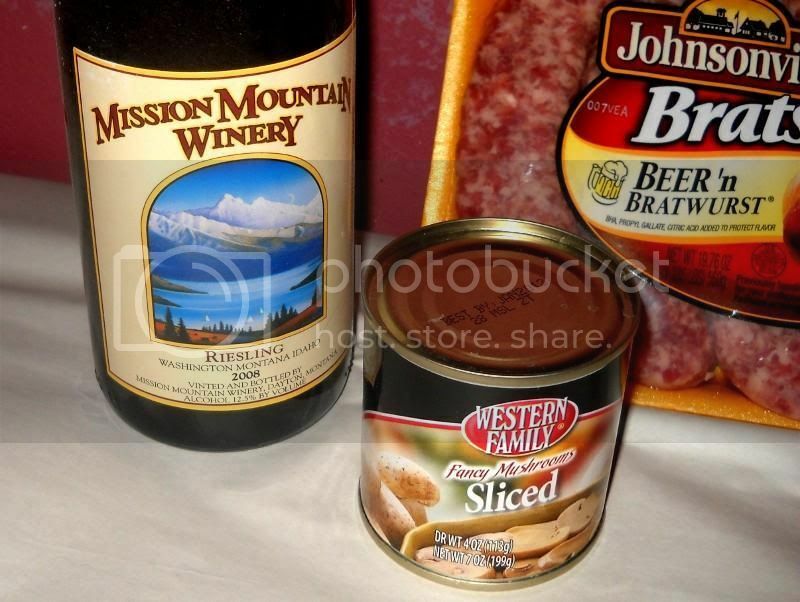 On a, cold, grey Friday night in November, I prepared a simple Swiss/German peasant supper for the beautiful Mrs. Tas and myself using this recipe. This was my third attempt at making rösti; the first two tries had not gone well and the potatoes had burned quite badly. After careful re-reading, I think I discovered why: the recipe, which i had never thoroughly read, specifies that the potatoes to be used should be par-boiled and cooled previously to shredding, Before, I had only shredded them raw and attempted to make the rösti before they were cooked. This time, I was determined to do it right, so I took a bit of a shortcut in the form of buying pre-shredded and frozen hashed brown potatoes. I also used a cast-iron frying pan, rather than the heavy-bottomed stainless steel pan that I had used the two times before. In spite of the washed-out flash of the photo, you can see that it worked fairly well this time with no sticking and a good golden-brown colour - not too bad! 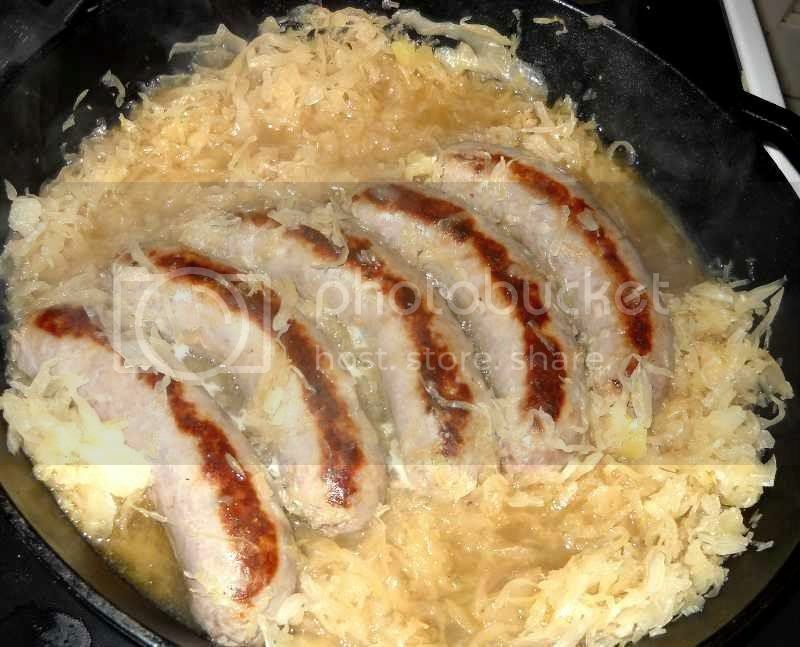 I kept the sauerkraut in motion and turned the bratwursts now and then during the entire cooking time for the rösti until the liquid had pretty much boiled away. The Montana-grown-and-vinted Riesling was a perfect accompanyment for this meal, which was a good fusion of German and Swiss specialties; probably not 100% accurate for either cuisine, but plenty of strong elements of both. 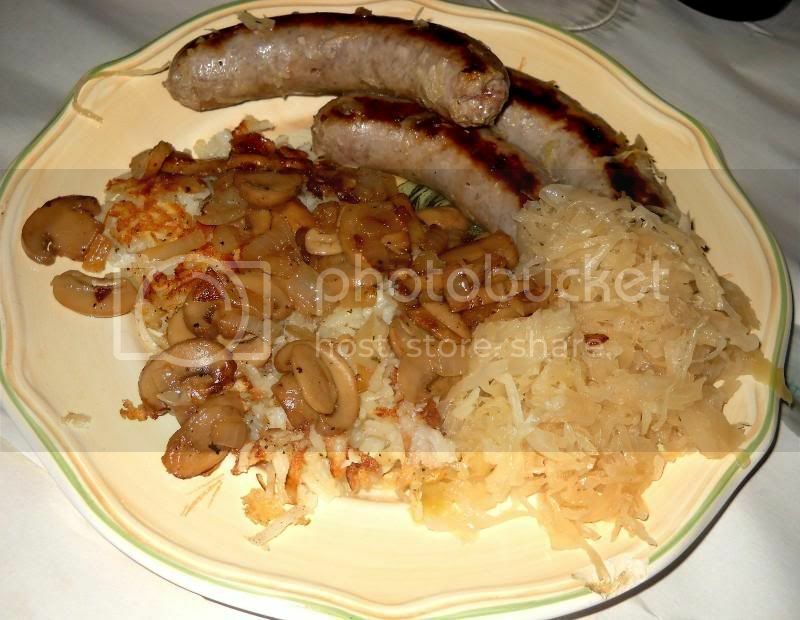 I elected to top the potatoes with the sautéed mushrooms and onions, rather than using the onions as a filling as mentioned above, but no big deal - i am sure somewhere along the line, someone in Switzerland has done exactly the same! 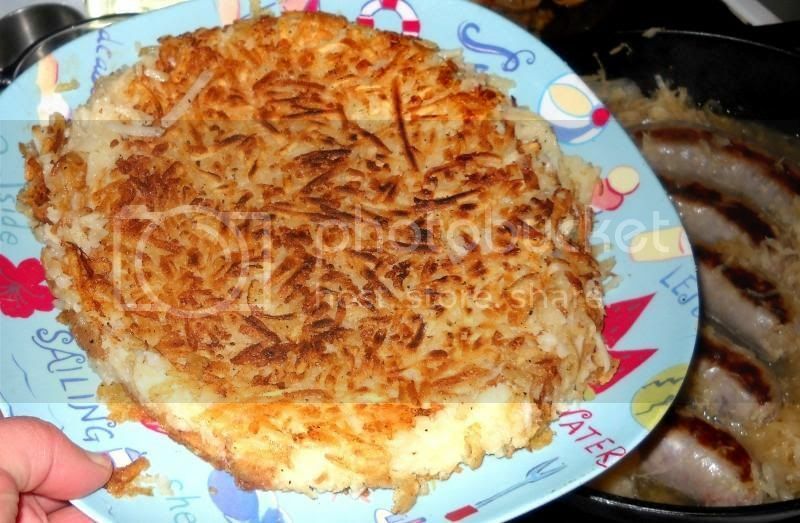 The highlight of the meal, the rösti, tasted very good with a crisp and buttery exterior and a tender, savory interior full of potatoey richnessness; a very good side dish that complimented the rest of the memorable meal perfectly. I love this stuff. It's a favourite side of mine, I've never tried it with premade hash though. I do a local spin sometimes by using kumara and heaps of paprika. Parboiling nis indeed key. I also leave them to stand in a colander after salting to draw out some moisture, I seem to get a better consistency that way. Outstanding! 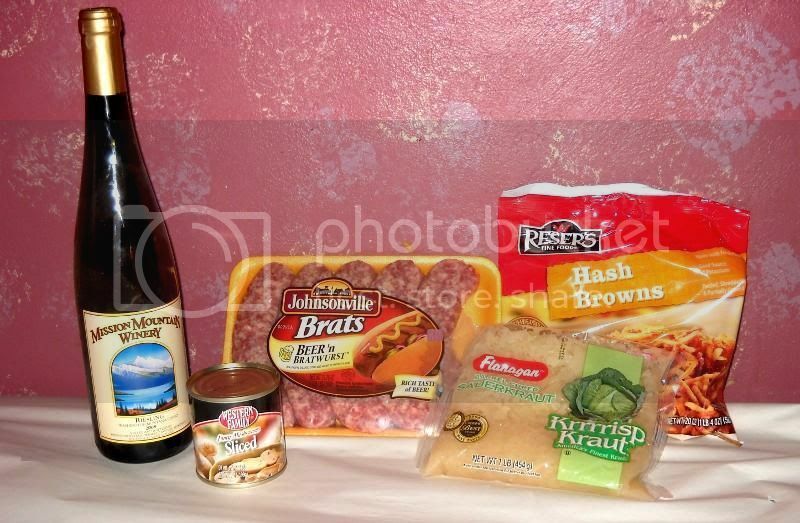 Very close to the sauerkraut and kartoffeln dishes which are traditional in the heavily German part of Indiana which Mrs. Andy's and my families hail from. You did good! Riesling is an excellent choice of wine as well. 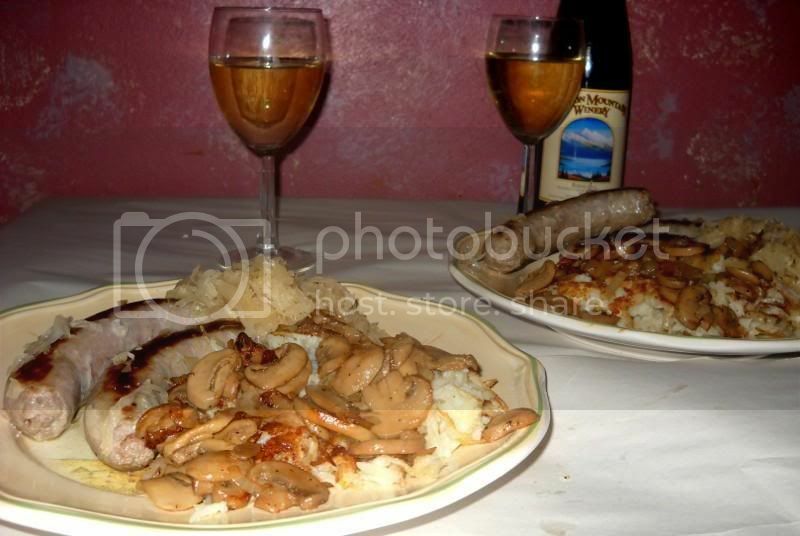 Very nicely done, and congratulations on your success~ the whole dinner looks fabulous and those mushrooms on top were the key touch of excellence, I would imagine, wow. Looks delicious and mouth-watering! How was the wine; did it go well with the dish? I imagine a Riesling would, just curious about that particular Montana wine which I've never tasted. Nice to hear about another culinary sucess! 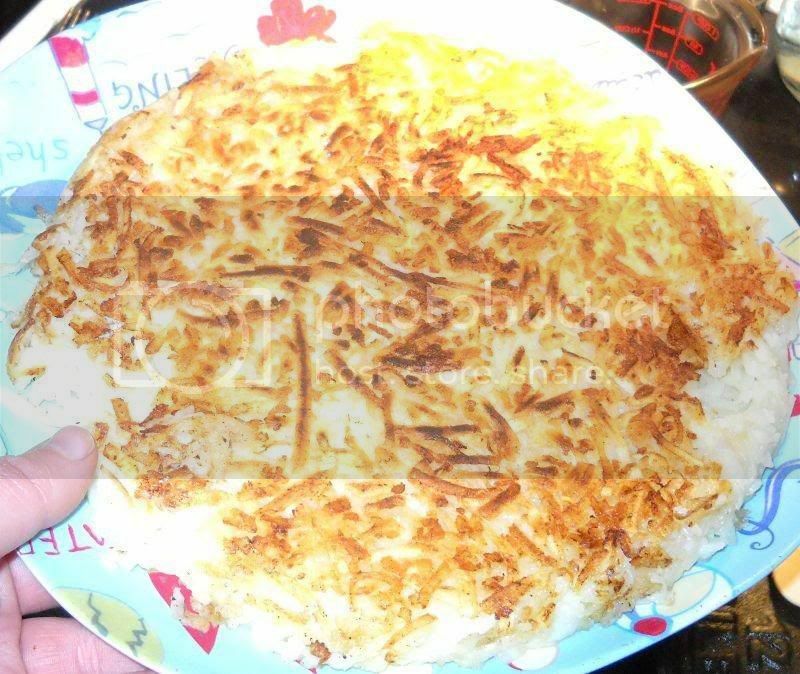 thanks, guys - the rosti was really good, and along with the rest of the meal, i was really ahving an old-world time. 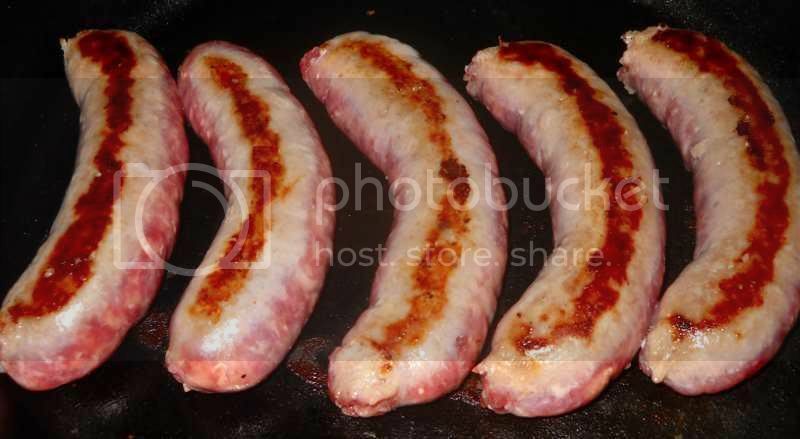 mrs. tas was not too impressed with the bratwursts; they are un-cured and un-smoked, which have a flavour that she is not fond of; however, she did enjoy everything else. kiwi - i imagine that the parboiling plus straining would have worked very well - the choice of pre-made shreds was due to convennience and because i wanted to be sure to do it right this time. next time, i would like to try the home-made way. andy and john - this was the first riesling i had ever tried, and i was suitably impressed i am not yet enough of a connosuir to give a run-down of its characteristics, save to say that it tasted very good and it went very well with the meal. i could really get a full-grape taste with a little sweetness, but not too much. it seemed that as i let it sit a while, the taste got "fuller" and richer, although the chill had worn off. It does work a lot better if you start with cooked spuds, and use the coarse blade on your four-sided grater. Also, try adding a bit more oil and bringing up the heat next time. That should crisp up the outside while leaving the inside moist and tender. Combining oil and butter is a standard technique for raising the smoke point while retaining the buttery flavor. If you use ghee, you shouldn't have to add additional oil, and the nuttiness of the ghee should really compliment the potatoes. My Dad used to make a potato kugle that was similar in nature. He'd finely grate the raw potatoes and let them drain, then mix with eggs, seasonings, and a smidgeon of matzoh meal. Flour or breadcrumbs will do just as well. This was then fried in a skillet until brown and crisp on both sides. Which simply means that the author is incapable of the feat. A distant relative of my favorite breakfast, papas con huevos. A potato, unpeeled, in a 1/4" dice, slowly browned in some oil, 1/2 of a small onion, chopped and stirred in the potatoes until the onion pieces start to brown, than 2 or 3 eggs, lightly beaten poured over the potato-onion mixture, cooked until the eggs have set, served in warm corn tortillias with salsa. I have tried the hash browns available here, thought they were poor, stale and almost rancid oil and cook up soggy unless deep fried. I am sure there are decent brands available,just not here.